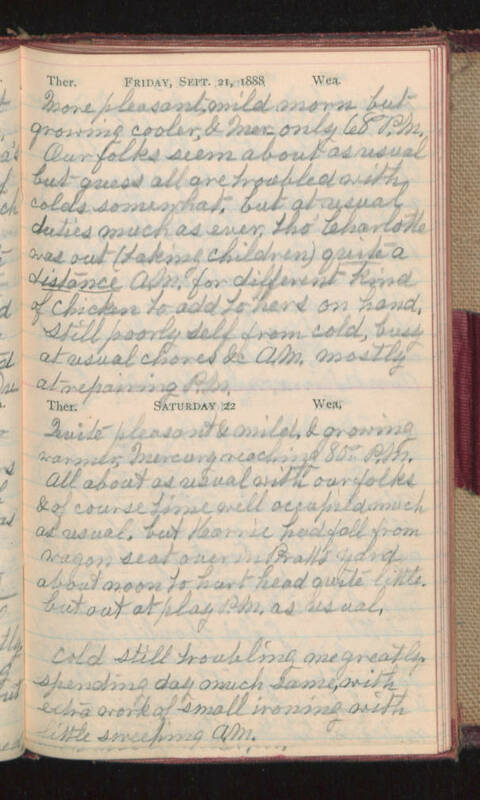 Friday, Sept. 21, 1888 More pleasant, mild morn but growing cooler, & Mer- only 68° P.M. Our folks seem about as usual but guess all are troubled with colds somewhat, but at usual duties much as ever tho' Charlotte was out (taking children) quite a distance A.M. for different kind of chicken to add to hers on hand. Still poorly self from cold, busy at usual chores &c A.M. mostly at repairing P.M. Saturday 22 Quite pleasant & mild, & growing warmer, Mercury reaching 80° P.M. All about as usual with our folks & of course time well occupied much as usual, but Karrie had fall from wagon seat over in Pratt's yard about noon to hurt head quite little, but out at play P.M. as usual. Cold still troubling me greatly spending day much same, with extra work of small ironing with little sweeping A.M.